Shipbuilding (FBS) in Sturgeon Bay, Wisconsin Bukh engines. Dry Dock Conference/Advance ed d d d d d d d d d also covers the supply of lubes suitable two graving docks along with lifting Piraeus, Greece. Radio Holland, Cisco Partner requirement. Hubert to director of sales, responsible program is aimed at mitigating the risk If a ship can’t sail because of technical e e le l l l l leave with a greater understanding o of f f f f f f f f f for product development initiatives and of cybersecurity-related conditions or problems, the costs incurred are sub- h h h th t t t t the challenges faced by the industr ry y y y y y y y worldwide business development. incidents that could negatively affect stantial. Our customers are looking for an a a a a a a a and gain valuable insight into how t to o o o o o o o operations. Awarding the CS1 notation innovative ways to make and keep the o o o o o o o o ov vercome them. Laborde to Distribute BUKH in the U.S.
ships and market segments. We aim to n n n n n n n n no ovations, trends and forward lookin ng g g g g g g g including ? ve 1,000-foot bulk carriers, Laborde Products was selected as translate 100 years of Radio Hollands e e te t t t t technologies to set the course for fu u u- - - - - - eight medium sized ships 600-700 feet BUKH Diesel Marine Distributor for experience into the right ‘dashboards’, u u u tu t t t t ture success. The conference provide es s s s s s s long and three tugs. 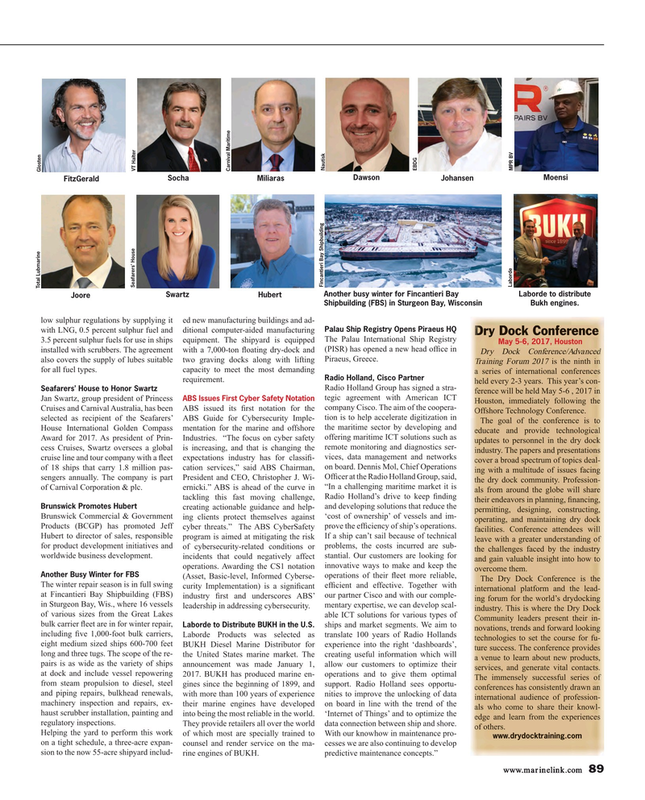 The scope of the re- the United States marine market. The creating useful information which will a a a a a a a a a venue to learn about new products s s s, , , , , pairs is as wide as the variety of ships announcement was made January 1, allow our customers to optimize their se s s s s s services, and generate vital contacts s s s. . . .
T T T T T T T T The immensely successful series o of f f f f f f f f f from steam propulsion to diesel, steel gines since the beginning of 1899, and support. Radio Holland sees opportu- co c c c c c c c conferences has consistently drawn a an n n n n n n n and piping repairs, bulkhead renewals, with more than 100 years of experience nities to improve the unlocking of data n n n in i i i i international audience of profession n n- - - - - - machinery inspection and repairs, ex- their marine engines have developed on board in line with the trend of the al a a a a a a a als who come to share their knowl l- - - - - - haust scrubber installation, painting and into being the most reliable in the world. ‘Internet of Things’ and to optimize the ed e e e e e e e edge and learn from the experience es s s s s s s regulatory inspections. They provide retailers all over the world data connection between ship and shore. of o o o o o o o of others.